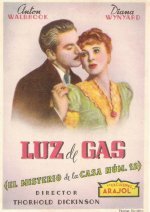 Most viewers will be more familiar with George Cukor's 1944 MGM remake than with this British National original of Gaslight, directed by Thorold Dickinson from the successful play by Patrick Hamilton. To make sure its production had the field to itself, MGM bought up prints of its British rival. Anton Walbrook is a match for Charles Boyer as the sinister husband. Many UK film enthusiasts regard this original version as the superior film. A newlywed couple move into the former residence of an heiress who was murdered 20 years earlier. Rumours persist of a priceless stash of rubies hidden within the house and, when an ex-policeman recognises the husband as a relative of the murdered woman, he suspects the man has returned to claim the missing loot.